Illinois State Senator Kwame Raoul ‘93 was instrumental in the recent legislation abolishing the death penalty in Illinois, and will be speaking at Chicago-Kent on a CLE panel with the ABA Death Penalty Representation Project on September 12. He will also be recognized by the IIT African American Alumni Association on September 22 at their Homecoming Honors Gala dinner. When not serving in Springfield, Raoul is a partner at Quarles & Brady, LLP, focusing on employment and labor litigation. We are honored to welcome retired U.S. Supreme Court Justice John Paul Stevens for a lecture on Wednesday, October 3 at 1:30 p.m.
Due to limited seating, we are offering a lottery for alumni who wish to attend. For more information and enter the lottery, please visit www.alumni.kentlaw.edu/justicestevens. Sponsored by the Jury Center at Chicago-Kent and the Institute on the Supreme Court of the United States (ISCOTUS), Justice Stevens’ visit marks the third U.S. Supreme Court Justice to lecture at Chicago-Kent in the last year. Chicago-Kent also will be hosting several other Supreme Court-themed programs this fall, including the 2012 Chicago-Kent Supreme Court IP Review (SCIPR) on Thursday, September 13; the Constitution Day Lecture on Monday, September 24 at 5:00 pm titled “The Tough Luck Constitution and the Fight Over Health Care Reform” by Andrew Koppelman, John Paul Stevens Professor of Law and Political Science at Northwestern University; and the Symposium on the Supreme Court and the American Public on November 15-16, featuring Judge Richard A. Posner and Linda Greenhouse and presented by ISCOTUS and the Chicago-Kent Law Review. As our school year gets underway, don’t forget about great volunteer opportunities coming up for ASCK Week 2012: Alumni/Student ConneKtions, the Society of Women in Law mentor program, and the Tournament of Champions here at Chicago-Kent in October. for dinner in her home for ConneKtions @ Dinner in March. SIgn up to host your own dinner during ASCK Week, October 8-12. This fall is an ideal time for alumni who are looking to volunteer with the law school for a variety of programs. ASCK Week 2012: Alumni/Student ConneKtions pairs alumni with current students for resume reviews, mock and informational interviews, and job shadowing over the week of October 8-12. For more information, visit www.alumni.kentlaw.edu/asck. Please also consider hosting a ConneKtions@Dinner during the week or a participating in the new Coffee ConneKtions program on Friday, October 12. 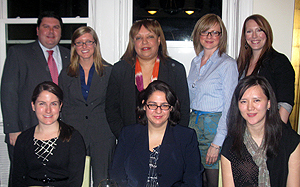 The Society of Women in Law is recruiting alumnae to serve as mentors for 2012-2013. Mentors are asked to meet with their student mentees three times throughout the course of the academic year and attend a kick-off reception on Wednesday, October 17 at the law school. For more information, visit www.alumni.kentlaw.edu/womeninlaw. From October 24-27, Chicago-Kent will host the National Institute for Trial Advocacy's Tournament of Champions, and the law school is in need of alumni with at least five years of work experience to serve as evaluators during the trial rounds. Initial and semi-final rounds will be held at the Richard J. Daley Center, with the final round in the Abraham Lincoln Marovitz Courtroom at Chicago-Kent. To volunteer as an evaluator, visit www.alumni.kentlaw.edu/toc. On Saturday, February 23, 2013, IIT Chicago-Kent College of Law will host its 125th Anniversary Gala – honoring the law school’s history, celebrating its milestones and envisioning an exciting future. If you are interested in serving on the 125th Anniversary Gala Host Committee, please contact Tara Anderson at (312) 906-5245 or tanderson@kentlaw.iit.edu. Are you an entrepreneur or do you work with entrepreneurs in your legal practice? Chicago-Kent faculty and students are looking to connect with alumni entrepreneurs for professional networking opportunities. Email alums@kentlaw.iit.edu and let us know about your business. Chicago-Kent Professor Heather Harper, supervising attorney for the Entrepreneurial Law Clinic in the Law Offices of Chicago-Kent, will also be participating in Entrepreneurs Unpluggd's Startup Law Summit at the law school on Saturday, September 22. Click here for more details and to register. Each year, the Chicago-Kent Alumni Association and the Alumni Board of Directors invite individuals and firms to sponsor the Alumni Awards & Recognition Luncheon, taking place Thursday, November 15. The luncheon benefits the Chicago-Kent Alumni Board Scholarship, awarded annually to students who display school involvement, financial need and academic merit. Sponsors at the $500+ level who commit their sponsorship on or before Friday, September 14 receive recognition in the invitation that goes to all alumni. For more information on the Alumni Awards & Recognition Luncheon, visit www.alumni.kentlaw.edu/awardsluncheon. Wednesday, October 3, 2012 | 1:30 p.m.
A lottery for alumni who wish to attend is available at www.alumni.kentlaw.edu/justicestevens. Thursday, October 18, 2012 | 5:30-10:00 p.m.
Thursday, November 15, 2012 | 11:30 a.m.
Thursday, September 6, 2012 | 6:00 p.m. Note: This is an informal gathering organized by alumni in the DC-area. Email Mike Hallock ’08 at hallockmikej@gmail.com with any questions. Hotel group rate reservation deadline: Tuesday, September 11. Featuring remarks by IIT President John Anderson and Dean Harold J. Krent. RSVP to alums@kentlaw.edu by Tuesday, October 16. RSVP to kentcso@kentlaw.iit.edu by Tuesday, October 16. Saturday, September 22, 2012 | 9:00 a.m.-2:00 p.m.
$99 early bird rate through September 22. Monday, September 24, 2012 | 5:00-6:00 p.m.
"Under Watchful Eyes: Privacy and the Technologies That Track"
Friday, October 5, 2012 | 9:30 a.m.-4:30 p.m.
Thursday, October 25, 2012 | 8:30 a.m.-4:00 p.m.
Co-Sponsored with the Illinois State Bar Association. 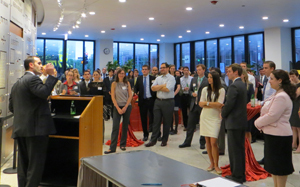 More than 100 alumni and current students from the Chicago-Kent Law Review gathered for a networking reception on August 14. View photos from the event on Flickr. (L-R): Angela Zeman '03, Tim Ritchey '05, Kevin Saunders '09, Jason Sposeep '03, and Michael Aschenbrener '07. Paul Ferak '00, president of the new Law Review Alumni Board, addresses the crowd of alumni and current students. 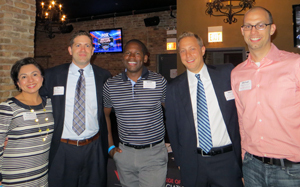 Join the official Chicago-Kent Alumni group on LinkedIn! 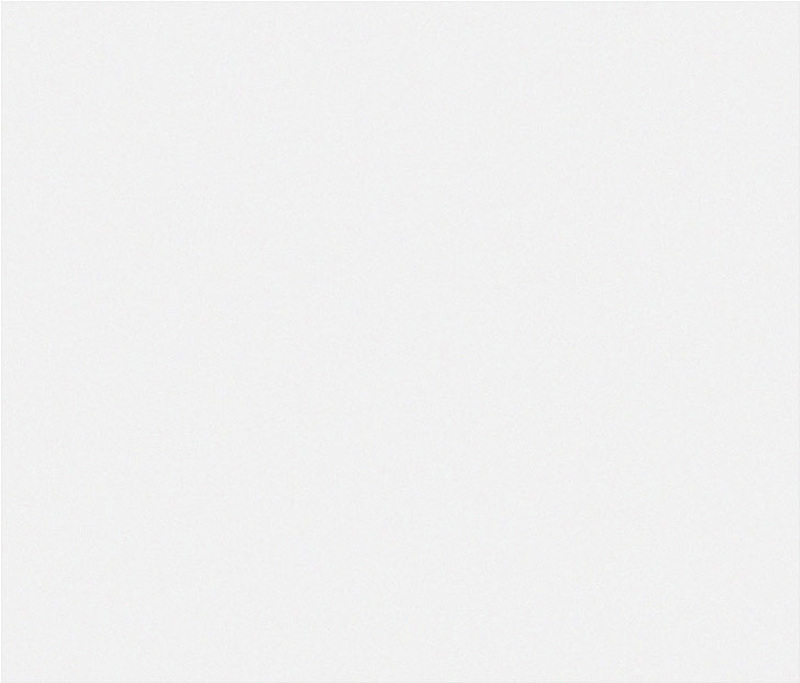 discuss legal news, seek referrals, and grow your professional network.